Babies are wonderful little creatures, learning every minute of every day. New experiences are key to their development, so it’s important to choose toys that give babies a chance to learn, while above all having a heap of fun. These three brilliant products from one of our favourite brands are sure to have your baby giggling in delight. When we want to know how best to entertain our babies, while helping to stimulate their senses, we turn to one of the world’s leading infant and preschool brands, Fisher-Price. 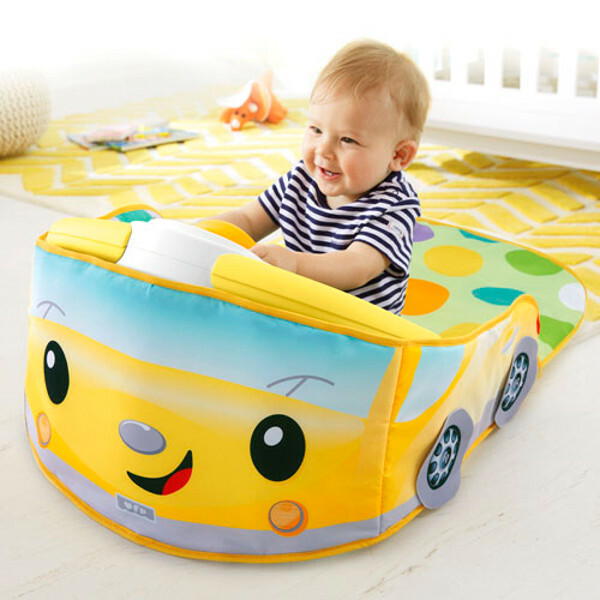 For more than 80 years, the creative folk at Fisher-Price have been researching and creating superb children’s products – all with the ultimate aim of fostering the development of little minds and bodies. If you’re looking for three must-haves that will give your baby months of joy, we’ve found them! If there’s one thing we love at Babyology, it’s products that will last the test of time. 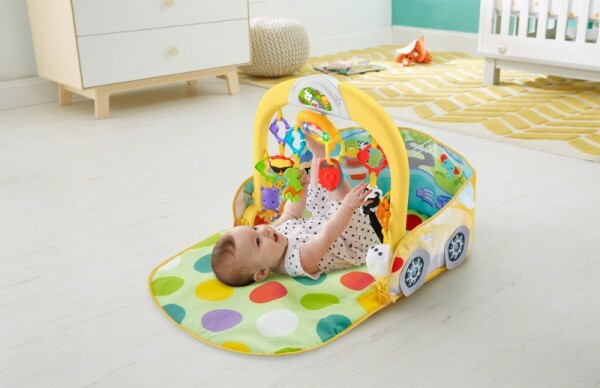 The Fisher-Price 3-in-1 Convertible Car Gym is one of those nifty toys that you can use from newborn right through to toddlerhood. It begins life as an activity gym, allowing baby to reach for the hanging toys. Once they’re indulging in a little tummy time, the toy bar can be lowered to floor level, and there’s plenty of sights and sounds that will encourage them to push up and build their strength. When your baby is sitting up, it’s time to head to the driver’s seat! The toy bar can be moved to a 45 degree angle so it resembles a dashboard (and talk about detail, there’s even a fluffy die and a vanilla scented skunk air freshener!). 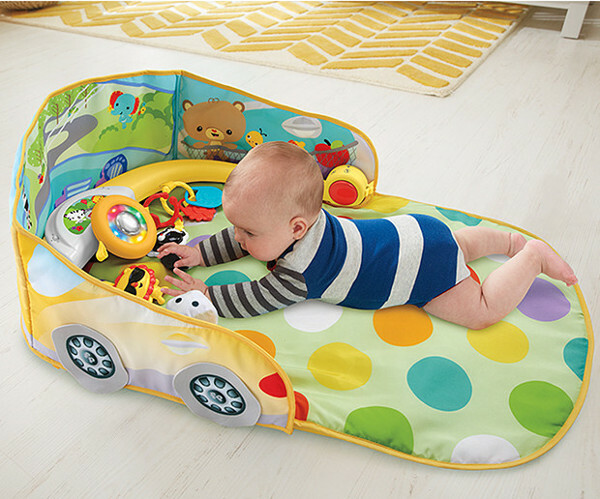 The mat is designed to be a part of your baby’s play-based learning for many months, and you can toss the soft mat into the washing machine if it gets grubby. This is one of those great toys that not only helps calm babies, but parents! 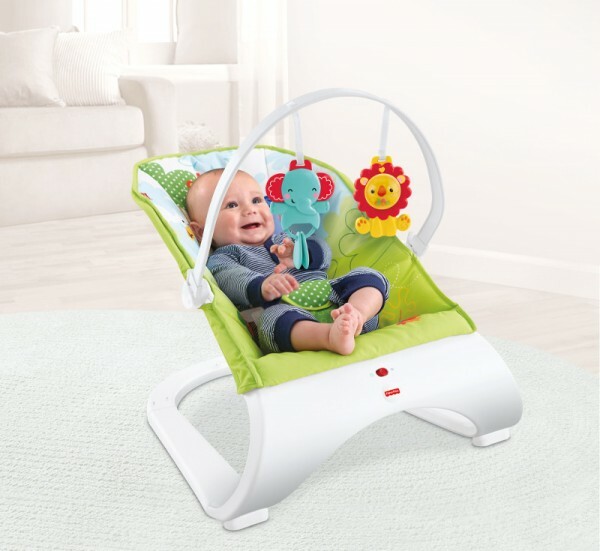 The Fisher-Price Rainforest Friends Comfort Curve Bouncer essentially gives you another pair of hands to entertain and calm your child, while you complete what you need nearby. The bouncer is comfortable, with its luxe padded seat, and also has calming vibrations that can help settle a fussy baby (and make witching hour a little more bearable!). If your baby needs some distraction or playtime, attach the removable toy bar and they’ll be reaching out for their little rainforest friends in no time! We all need a little comfort now and again, and for babies, having a toy that helps soothe and provide comfort is really important. The adorable Soothe & Glow Owl is great way to get babies ready for bedtime, and become a part of their sleep cues. It plays hoot-hoot sounds and more than 15 minutes of lullabies. And we all know how keen babies are to chew anything within reach, so the feet are teethable for bub. This gorgeous creature is all about creating a comforting and calming environment when it’s time for a sleep. All of these products, and many more in the Fisher-Price range, are available from Target.